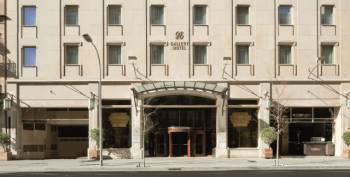 Gallery Hotel is a 4 star superior hotel exceptionally positioned in the centre of Barcelona just a stone’s throw from Paseo de Gracia and with Plaza Cataluña nearby. The Hotel has 110 rooms offering you comfort, tranquillity and where every last detail is taken care of to guarantee your stay will meet your every expectation.The hotel also has 8 function rooms, holding up to 200 people, which are ideal for meetings and private receptions. Four are on the first floor and have natural light. All are fully equipped and can be organised as desired.In our El Café de Gallery Restaurant – Terrace you will find top quality cuisine along with a long list of wines you can enjoy either in the calm of our outdoor terrace or at your leisure inside the restaurant.Gallery Hotel stands in a league of its own in the heart of Barcelona, with a highly personalised service combined with a friendly atmosphere and avant-garde cuisine. Gallery Hotel is ideally suited for company and business use because of the quality of our service, the personalized treatment we give our guests and its excellent location. This is more than demonstrated by the high loyalty level of our current business clients and their degree of satisfaction.We have special business prices and conditions, both for individuals and for groups and meetings. We guarantee we will reply to you in 24 hours with an offer which meets your needs. You will always have the same member of staff to advise you and help manage your event to give you a better service and make sure everything runs smoothly.